In his 2010 book about Yash Chopra’s Deewaar, the historian Vinay Lal noted the centrality of the mother-son relationship in Indian society, and how it seeped into the DNA of mainstream Hindi cinema. As most of us know, our movie history is full of high-octane emotional moments involving the self-sacrificing “maa” and her laadla (or wayward, or both) son. There has been a much scanter tradition of interesting, strongly etched mother-daughter relationships (the old, gossip-magazine stories about virginal actresses and their domineering mothers who accompanied them to the studio may have been more dramatic than anything shown on screen). But this has been changing in recent years, with many filmmakers moving away from archetypes and depicting strong women, including single mothers who raise children without any male support. It’s fun to look at how some tropes have subtly altered over time. Twenty-one years after Aditya Chopra’s Dilwale Dulhaniya le Jaayenge, in which Simran (Kajol) and her mother Lajjo (Farida Jalal) talked about patriarchy’s shackles – we women don’t even have the right to make promises, Lajjo says – another candid but much less fraught ma-beti conversation occurs in Chopra’s new film Befikre. The heroine here, Shyra (Vaani Kapoor), hasn’t been raised to be sanskaari (my parents are Indian but I am French, are almost her first words in the film) – she leads a freer life than Simran could imagine leading, and there isn’t an Amrish Puri-like patriarch in sight. Yet she admits to secretly eating aloo parantha once in a while, because it reminds her of the protective warmth of her mother’s dupatta or her father’s jhappi. The moment passes quickly – this is not a film where parents and children get overtly sentimental in the “old-fashioned” Indian way (our cinema is too hip and ironic for all that now!) – but it is notable that it takes place. In other recent films, Neerja and Queen among them, mothers who themselves led orthodox lives try hesitantly to be friends and confidantes to their more independent-minded daughters. There have also been narratives where the need to present a strong relationship has resulted in crossed signals. Ashwini Iyer Tiwari’s Nil Battey Sannata – in which a lower-class working woman, Chanda (Swara Bhaskar), joins her adolescent daughter’s math class – was a fine film on the whole, but I thought it missed a trick: given how lively and intelligent Chanda is, the script could have explored the possibility of her becoming a little self-centred as she gets the education she was earlier denied; she could have been a caring parent and a competitor. But the mother-daughter story I was most intrigued by recently was Sujoy Ghosh’s Kahaani 2, the basic plot of which can be summed up thus: a woman named Durga (Vidya Balan) rescues a little girl from her pedophilic uncle (played by Jugal Hansraj), then flees the law and raises the child as her own daughter; eight years later, the past catches up with them. Put in that neat, linear way, this sounds like a straightforward relationship drama centred around a social evil. And indeed, the film has serious things to say about child-victimisation, parental responsibilities and the consequences of even educated families raising male children like princes who are answerable to no one. By the end, Durga’s role as a protective mother-figure has been affirmed; meanwhile, in another thread, a man gets a chance to redeem himself for the insensitivity he had shown towards his young bride years earlier (and does it, in a symbolic “cleansing” touch, by helping to blow up the house in which that insensitivity had played out, and in which he too had presumably been raised as a little raja). These themes are welcome, but what muddies the waters is that Kahaani 2 has the form of a thriller involving uncertainty about the reliability of Durga’s old diaries, and our anticipation of a twist that might overturn everything we think we know; our expectations are coloured by the complicated narrative structure (involving multiple strands in the present day, flashbacks to eight years earlier, Durga’s old romance with a man named Arun, and allusions to a still deeper past) as well as by memories of the first Kahaani and another Ghosh-produced film, Te3n. In some ways, Kahaani 2 is the antithesis of another mother-daughter story, Sanjay Gupta’s dismal Jazbaa. That film – about a woman lawyer, woodenly played by Aishwarya Rai, whose daughter is kidnapped – basically wanted to be a glossy, action-packed thriller (and Irrfan Khan, having a grand time as a badass cop, was the only actor who seemed willing to go along with this vision), but made very token nods to the subject of violence against women. The good intentions felt insincere and tacked-on (Gupta rarely comes across as being a good director of women, or even especially interested in them as people). 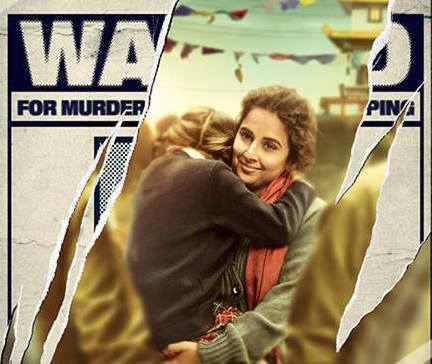 In contrast, Kahaani 2 is at heart a social-message film – with some scenes that play like an instruction manual for getting a victimized child to open up – but it masquerades as a sly thriller. And when it turns out that almost everything we saw was to be taken at face value, that there was no sleight of hand, it is deflating. I have no screenplay-writing aspirations, but I kept thinking of other possibilities that may have fit better with the way this story was being told. The really cynical twist would have been that Durga’s ideas about the little girl being abused were figments of her imagination, enabling her to perform a “rescue” and get a daughter-doll for herself. But there are other alternatives. Watching the film, I was reminded of Kazuo Ishiguro’s novel A Pale View of Hills, with its unreliable narrator, a Japanese woman living in England who engages in a form of guilt-transference as she recalls her distant past. And then I thought: what if Durga was subconsciously switching people around in her mind, and suppressing things she couldn’t deal with? What if the little girl was being abused, not by her family but by Durga’s courtly, harmless-looking boyfriend Arun, who simply vanishes from this narrative? So there’s an idea that could retain the integrity of the mother-daughter relationship while also retaining the integrity of the thriller format. As a bonus, it would allow those of us who have fond memories of warbling “Lakdi ki kaathi’ in 1983 to revel in the ultimate irony: the film’s Big Twist is that Jugal Hansraj is masoom after all. The second one is a remarkable film in my book. Crawford's greatest. And probably Curtiz's greatest film. I prefer it to Casablanca. Interestingly mother-son relationship is a more prominent running theme not just in Bollywood but Hollywood as well. I recommend the Kannada film "Gejje Pooje" with a mother and daughter playing lead roles, though the film doesn't dwell too much on their relationship per se. One of the great Kannada films. I noticed the increased use of the word trope on your blog. I happened to see it for the first time, in other articles around the same time. Do you know if any reason why this word usage has jumped up overall ? Also, no Alert for Spoiler ? No, I don't usually give spoiler alerts for columns anyway, since the assumption is that the piece might be of interest to someone who has already seen the film. Reviews are another matter. That said, part of the point of this piece was that there are no spoiler alerts necessary while discussing Kahaani 2 - the story doesn't have a twist. Unsure about "trope" - thought I had used it for years, but maybe not. Seems a fairly obvious word to use, along with "themes" or "motifs", if one is discussing films or books in that way.